Hello Cinesportstalk fans! I bring to you the latest installment of my blog. This week I go back to just a film from last year in that I found pretty compelling and something that, I believe, Hollywood hasn’t done in a long time, an original idea. Sucker Punch was a film that had pretty good cinematic photography and a really interesting story to boot. Then again I do love the whole anime, kickass girls, and rpg aspect of the movie. You will too if you found any of those ideas a good one. This movie is a little out there at the beginning, and it’s one of those that you have to pay attention, but once the story comes together, it really comes together. Not to mention a great soundtrack that I quickly downloaded when the movie was over. Director Zach Snyder focuses on Emily Browning as the star of this one. The premise of the movie is her getting carted off to a mental hospital by an abusive step father, I know classic villain, but we learn very shortly that this isn’t the story you think. Miss Browning has to find a way to escape the hospital with the help of some people she meets in the institution. The movie changes from various scene to various scene. That’s why you kind of have to pay attention until you get what’s going on. Personally I love the way it was filmed, and even more love the original idea that Snyder brought to the movie. Will they do a second one? Probably not, but hey I’ll take this for what it is. Hello Missed It fans! This weeks installment was inspired because I heard Johnny Cash through Pandora and thought, hey maybe I should watch “Walk the Line” again. Here you go, this weeks review takes us back to 2005 when Joaquin Phoenix and Reese Witherspoon lit up the screen in Walk the Line. For those who may not be into this type of movie, it was a great picture. It is pretty much about the story and life of legend Johnny Cash as he started out in making music and then him coming into his fame. Hello Cinesportstalk fans! I am back. Now, I know that I have been away for awhile, and for that I’m sorry. However, here we go with another installment of In Case You Missed It! 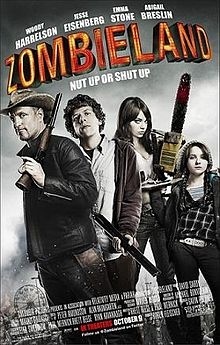 This weeks review is for a little diddy that I saw called Zombieland. With the country in full zombie swing I figured why not. Hello my Cinesportstalk fans! I bring to you another installment of “In Case you missed it!” With football season in full swing I thought it would be fitting to bring on a review of a movie that was all about the great game with the pigskin. 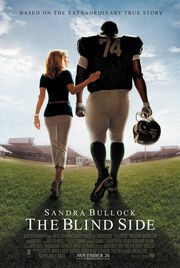 This weeks movie is The Blind Side, starring Sandra Bullock, Tim McGraw and Quinton Aaron. This 2009 release was a good one, and largely based on a true story. Even though, well, to me that Hollywood embellishment has to be there it was a good movie overall and really warms the soul. The story unfolds with Michael Oher, who is pretty much homeless, gets set up in a really great school, but is still struggling with hard times. He meets Leigh Anne Tuohy (Sandra Bullock) and she takes him in and pretty much saves him from the ruins of the street. What she doesn’t realize, at first, is that he’s a dang good football player. He starts off like any person who has never played and pretty much stinks. However, as he goes through the movie you see him progress until he has every big wig college coach drooling at the mouth for him. By the way Nick Saben is an awful actor. He tries, but eww. Hello movie goers! It’s time for another installment courtesy of me. 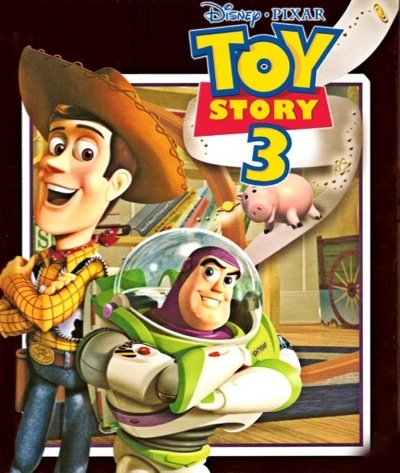 This weeks “In case you missed it” is a wrap up to a great series in a very winning combination in Disney Pixar’s Toy Story 3. I know, I know you thinking wow Dawn you don’t even have any kids. However, the truth is this was a great movie. As a big fan of Disney myself I have loved the other two movies, but I’ll put it out there in saying that this was the best of the series. This was a first release in the summer movies of last year, and it was worth the buzz. Director Lee Unkrich, who also did the first two in the series, is back for this closer. He brings back all of our favorites in Woody, Buzz, and Jesse, but also introduces us to a few new characters that you are sure to love. Tom Hanks lends his voice once more into the ultra lovable Woody, who does take center stage for this one. Andy’s toys are mistakenly taken to a day care instead of put in the attic when Andy is getting ready for college, and things really don’t seem as good as they are when the toys get there. Woody takes on the task of trying to convince Rex, Ham, and the rest of the gang that they weren’t abandoned and try to bring them home. The thing with Toy Story is that well it really isn’t just a kids movie. I’ll be the first one to tell you that no one does sexual tension in barbies quite like Disney can, and it’s really hilarious. There are some surprises in this movie that are fantastic, and by the end it will give you the urge to get your Mr. Potato head out and play like a kid once again. The opening scene of the movie is a play sequence and I have to say Andy is one bright guy for coming up with some of this stuff. But that’s the genius in this type of movie is that it does bring you back to when you were a kid, and the painful time it was when you really stopped playing with your favorite toys. Oh and by the way spanish Buzz Lightyear is amazingly funny! While funny and lighthearted the movie is, Disney Pixar does look at the darker side of toys with a very interesting back story. Lotsa, your token bad guy, gets a look back into his life, and it is not all cute and cuddly. I would even venture to say that it might be a little scary for the very young kids, however, it brings a richness to the character like no other villain has before. You truly want to hate this bear by the middle of the movie. I guess they did the job right when creating this character. The whole story was great in the very good Disney storytelling way, and you won’t be disappointed. All in all if you have kids this is a good watch, if you don’t, hey it’ still a good watch. I would recommend this for any Netflix user who streams, like I do, and wants to watch a really light-hearted movie. This is one of Disney Pixar’s best, and one hell of way to close out a great series. Until next week! Hello Cinesportstalk fans! Dawn here to give you a little different movie review. Recently nothing has been blowing my skirt up in the theaters so I have been leaning more towards what is on HBO, Encore, and other various movie channels on cable. Hell, we pay all that money for 200 channels plus, so why not? Therefore, I came up with a movie review idea for movies that I didn’t catch on the silver screen, or ones that I have never heard of. Bottom line is these will be my picks for you to either watch now or to not waste your time with. Hope you enjoy! This week’s review is for a movie called Machete. From what my husband tells me, it was advertised a bunch. I don’t remember having seen it, but it was a great flick. It’s currently running on HBO, and I’m sure you can rent, download, or buy the DVD or Blu-ray for it as well. The movie was released last year and stars Danny Trejo. He’s the token [insert Hispanic star] kinda guy. Other stars include Michelle Rodriguez (hottie) and Robert De Niro. The basis of the movie is an enraged ex-federal agent who tries to get revenge against his former boss. Yes, it has some twists and spins in it, but I don’t want to give too much away. If you like a classic hack and slash type movies, this is also your cup of tea. Director Robert Rodriguez puts on a very un-Sin City like movie and uses it to be more action oriented. The story is easy to follow, and being a fan of really witty writing, there were “LOL” moments that I still go back to watch.